That brand new WordArt-inspired logo isn't the only thing that's changed at Yahoo. Yahoo Mail received a full redesign for its recent Sweet Sixteen birthday on October 8. But like a spoiled teenager, Mail quickly turned into a nightmare and now users are complaining about much more than its new look in giant internet droves. In just six days, thousands of Yahoo Mail users have taken to the Yahoo Voice feedback page highlighting a myriad of issues. On a 2,133-page-long user forum, there are entries for everything from complaints about new emails no longer showing up in bold to a petition to bring back tabs, which at last check had 27,626 votes. A large part of the issues seem to include basic functions that are slow and in most cases simply don't work, including the ability to open folders without having to exit the inbox. Others are poor design choices such as how the delete button can be easily clicked when hovering the cursor over messages in the inbox. There are also a number of user reports saying Mail is breaking down to the point where it's unable to auto-save, delete drafts or send email through the secure SSL channel. What's more concerning is that at least one person reported losing emails stored in folders (we actually ran into this bug ourselves) and Yahoo is automatically removing contacts from people's address books. TechCrunch also reported that Yahoo Mail has been automatically forwarding emails to users' alternate, external email addresses through a setting that was switched on without users' permission. In total, there are around 42,660 complaints hovering around the Yahoo Voice page. Meanwhile, the Yahoo Mail community has come up with 4,596 ideas to fix the client's bugs and errors. 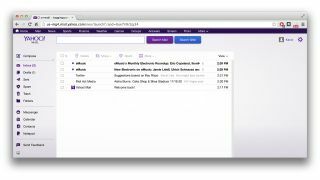 "The recent design changes in Yahoo Mail are important steps to building a more modern and personalized version. We recognize that this is a lot of change and are actively listening to user feedback so we can continuously make improvements." Yahoo has starting alleviating some of the issues, possibly through background updates. We noticed that new emails are starting to show up in bold and folders are becoming accessible from the inbox. It is possible to even send some emails out which, we know, is pretty mind-blowing. Let's just hope the purported new Yahoo homepage redesign goes a lot smoother. Want to appear in ads on Google? Now you can!